Children of the Sun Sunflowers was one of my class demonstrations and is a painting of one of my absolute favorite flowers. 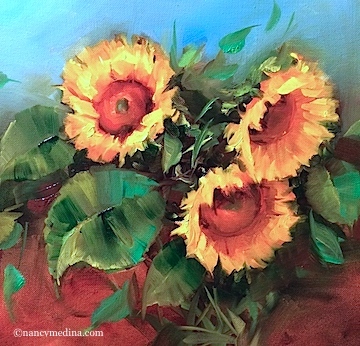 I grew up on an organic farm in East Texas where the 10-foot tall sunflowers attracted insects off the crops, fed the birds, and provided rows and rows of beautiful color. I remember being embarrassed when friends who lived "in town" would come to visit, since they would see our country life, how we lived in a very basic house, wearing hand-me-downs and rarely doing the things city kids took for granted, such as going to the pool or shopping at the mall. For us, "going to town" was an event, and if we stopped at the Dairy Queen for ice cream cones when Dad finished his errands, this was a huge treat. I am so glad, now, that I had this simple, focused life, when my summers were spent reading every book I could lay my hands on, and enjoying the companionship of the animals, and playing with my sisters. We used our imaginations to build worlds and games. We had no internet, no video games, and no cable TV. Maybe this is why I love painting from life so much. Because there was nothing artificial that filled the days of my youth. My parents had a picnic table in the back yard and I remember one fall they placed all the dried heads of sunflowers out, creating a smorgasbord for the wild birds. Tomorrow I pack up the supplies for another 3-day workshop here in North Texas, my last summer workshop for the year. I love teaching, but even better I love shopping for fresh flowers the day before class. You never know what treasures the flower store will have! One seat left in my North Texas Workshop!